But it’s not so common in the world to find a blood cockle bar. 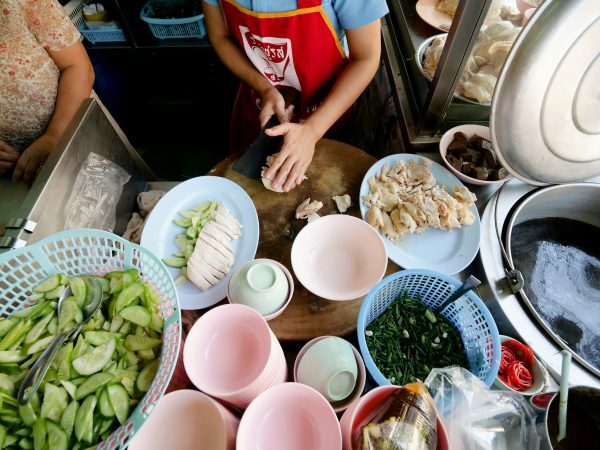 Located along Soi Texas (road) in Bangkok’s Chinatown, Hoy Kraeng Pa Jeen (หอยแครงป้าจิน) has been open and selling blood cockles, from a street food cart set up with bar counter seating, for over 40 years. 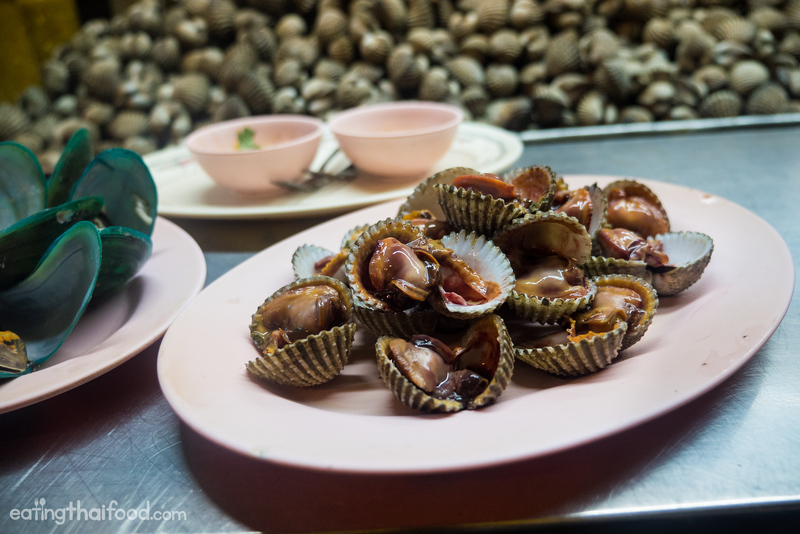 The blood cockles, which are lightly boiled and served with a dipping sauce, are incredibly fresh, and for any shell-fish lovers, they are superb! The mountain of blood cockles! First, what are blood cockles? 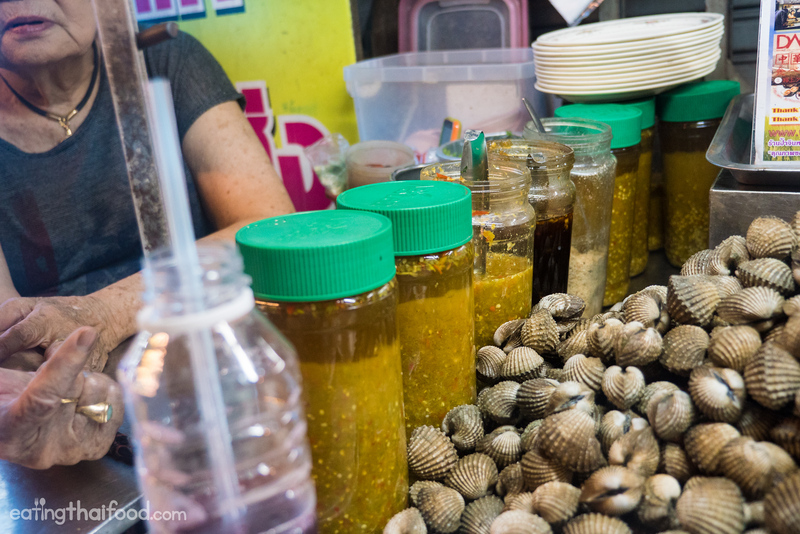 Before we get into eating blood cockles in Bangkok, let’s just quickly go over what a blood cockle is, and how popular they are in Thailand. 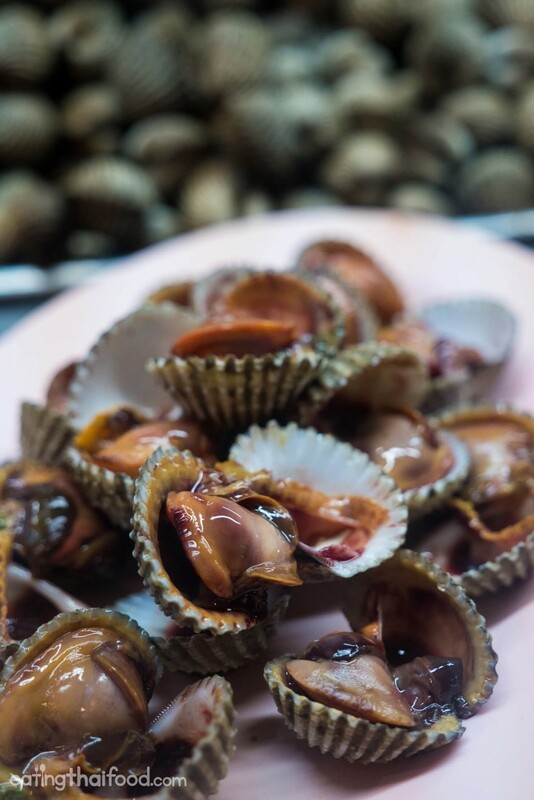 Blood cockles, which are also known as blood clams, are a species of ark clam. As soon as you eat a blood cockle and see the red liquid that comes out of the shell along with your bite, you’ll know exactly why the description fits so well. According to Wikipedia, the red liquid comes from hemoglobin, the iron filled oxygen protein in red blood cells. 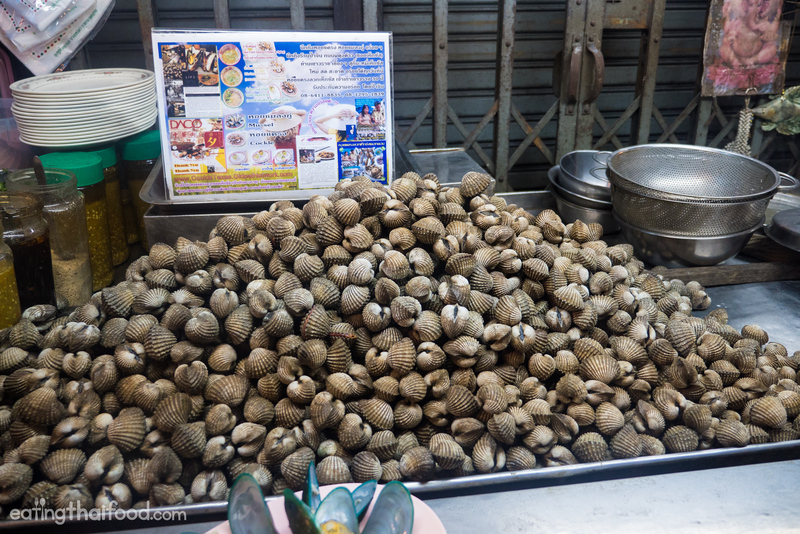 In Thailand and throughout Southeast Asia and Southern China and even throughout the world, blood cockles are extremely popular and heavily consumed. 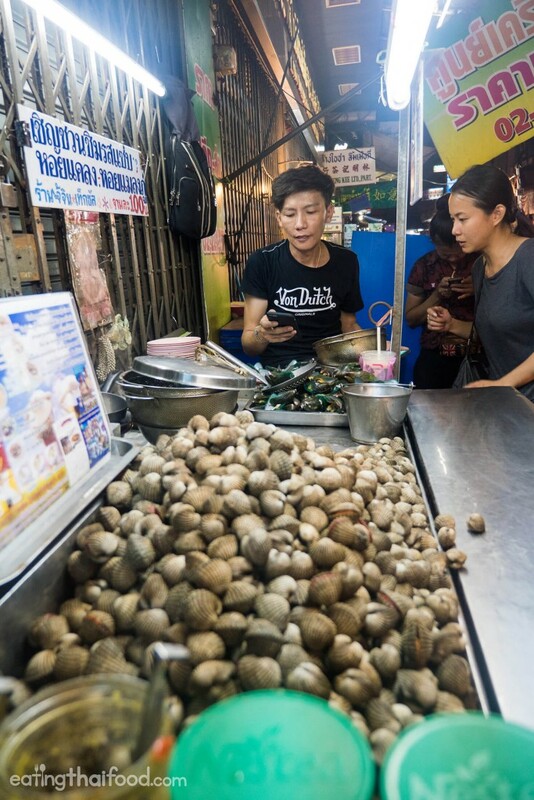 Many Thais, my wife included, get a craving for blood cockles that can NOT be sidetracked until we go to eat some blood cockles – seriously. 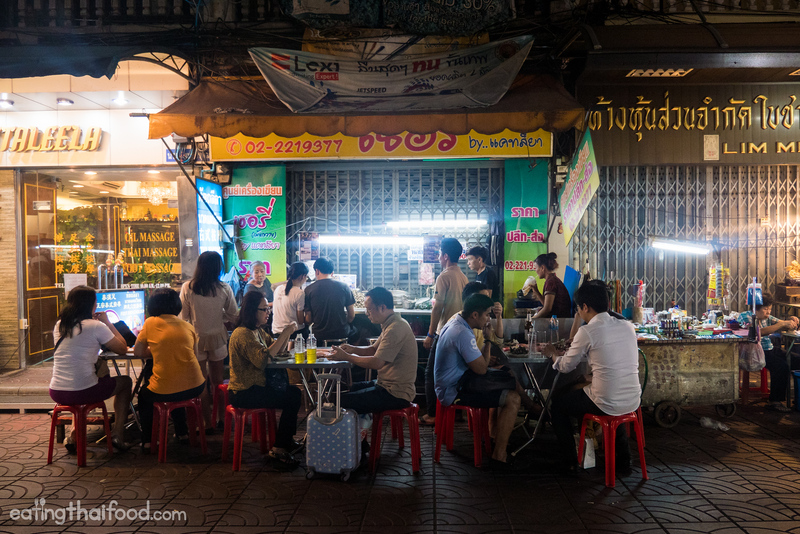 You can typically find hoy kraeng (หอยแครง), at most Thai seafood restaurants throughout Bangkok, and often at Isaan (Northeastern Thai) restaurants as well. 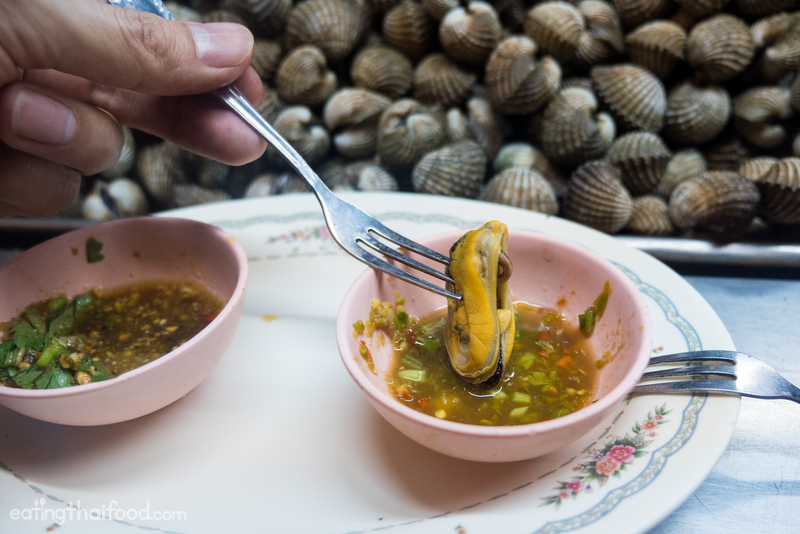 One thing I’d like to quickly note, is that even in Thailand, where blood cockles are widely loved and consumed, they are also known to cause stomach problems and “tong sia (rotten stomach, or diarrhea) – especially when they are not fresh. 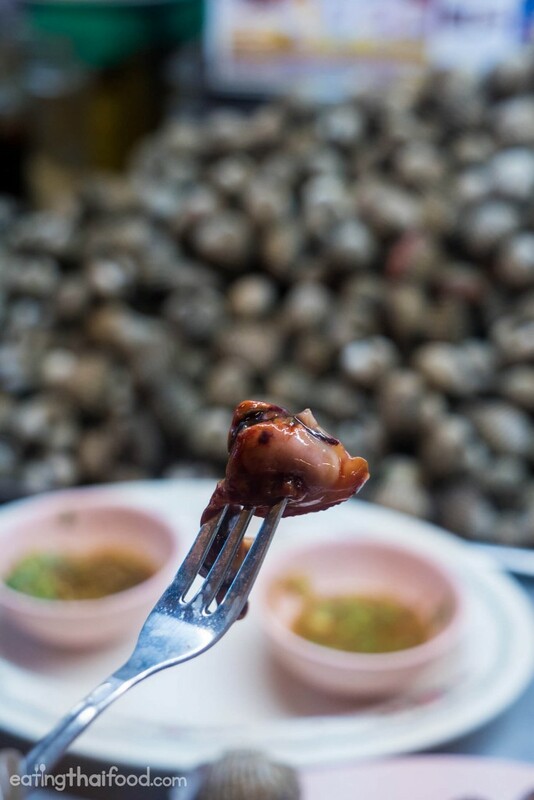 So it’s really important to eat blood cockles that are very fresh… and that’s where Hoy Kraeng Pa Jeen (หอยแครงป้าจิน) comes in. Hoy kraeng (หอยแครง) means blood cockles in Thai, and Pa Jeen (ป้าจิน) is the name of the owner of the stall. Simply boiled (but perfectly boiled), and served with a dipping variety combination of sauce, the cockles she and her son serve, are not complicated… but the freshness and quality is unparalleled. The son of Pa Jeen (ป้าจิน) is now the one in charge of cooking the blood cockles and mussels, and he sits off to the right hand side of the stall, in front of the pile of blood cockles, and with simply a pot of perfectly boiling water in front of him. Every-time he gets an order, he scoops out some shells, swiftly dunks them into the boiled water for just the right amount of time (I think about 20 – 30 seconds or so), gives them a few shakes, and places them on the side. While still piping hot, he proceeds to grab each shell, and using Star Trek looking blade attached to his thumb on a ring, he quickly shucks open each shell. He does this process so fluidly and with so much experience, that my wife was talking to him and asking him questions, and he was smiling and have a full conversation while still preparing the blood cockles – I know I for sure couldn’t multitask like that! 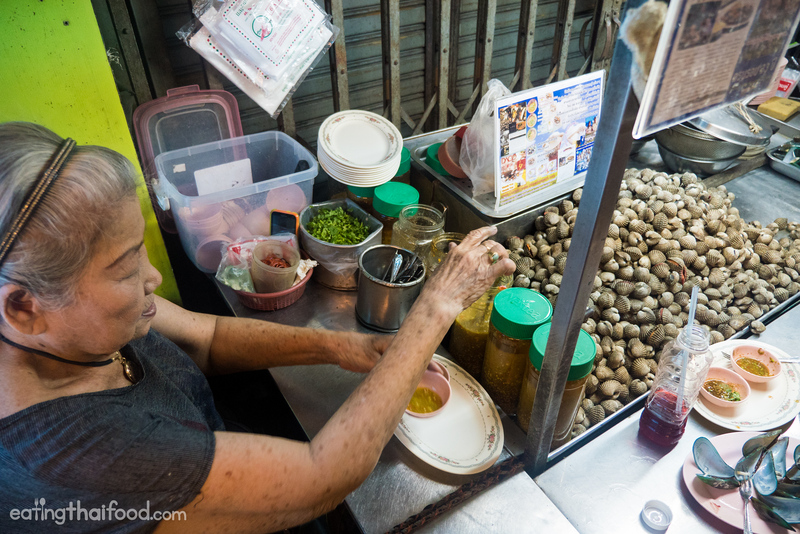 Pa Jeen (ป้าจิน) sits on the opposite side of the cockle cart, and she’s in charge of the sauce. 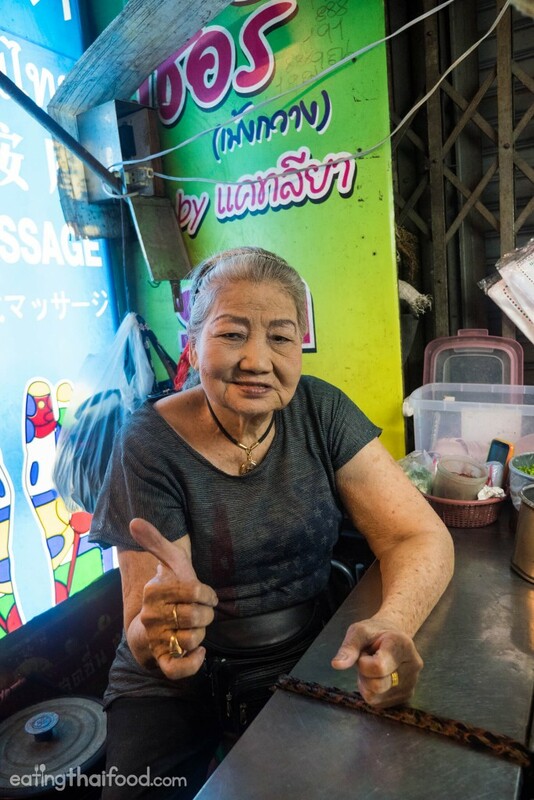 She typically scoops you out a couple of different sauces, but if you ask, she can make them according to your taste – more spicy or less, more sweet or less, or with extra peanuts. One thing you need when you eat blood cockles is sauce. And along with fresh cockles, Hoy Kraeng Pa Jeen (หอยแครงป้าจิน) is a purveyor of marvelous Thai seafood dipping sauces. She has about 6 – 8 jars of sauce, some of them fully mixed, others I’m not even sure what they are, but when an order comes in, she grabs a bowl, and starts mixing and matching some different sauces like a sauce scientist. 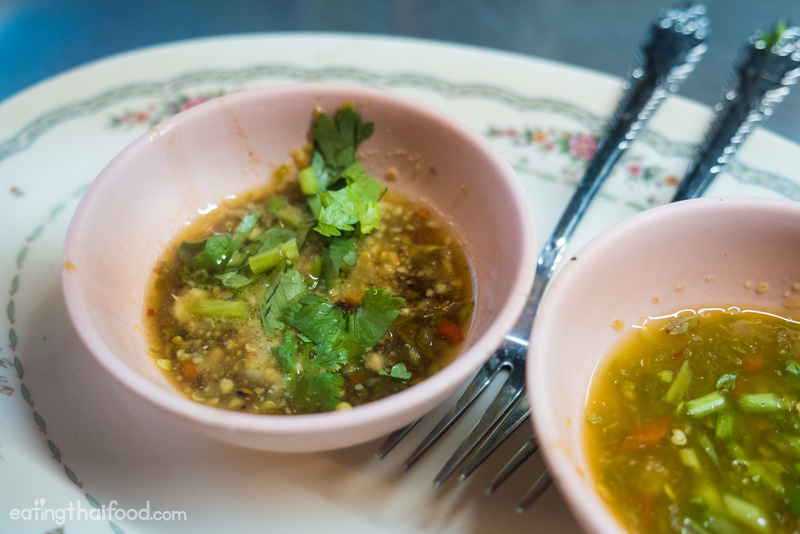 I got two different sauces, one a completely sour and not sweet chili sauce, filled with the pungent green bird’s eye chilies, and another sauce that was slightly sweets and with a scoop of crushed peanuts. Both were good, but I loved the extra sour spicy sauce the best. Let’s begin with the plate of hoy kraeng luak (หอยแครงลวก), boiled blood cockles. After being boiled and shucked, the plate was placed before me on the street cart bar counter, and it was undeniably one of the finest looking and freshest plates of blood cockles that I had ever seen in Bangkok before. The blood cockles were so big and plump that they overflowed from their shells – like they were begging to be shucked and eaten. He boiled the shells so they were not fully cooked, but cooked just enough to take off the slimy texture, and be left with juicy cockles. 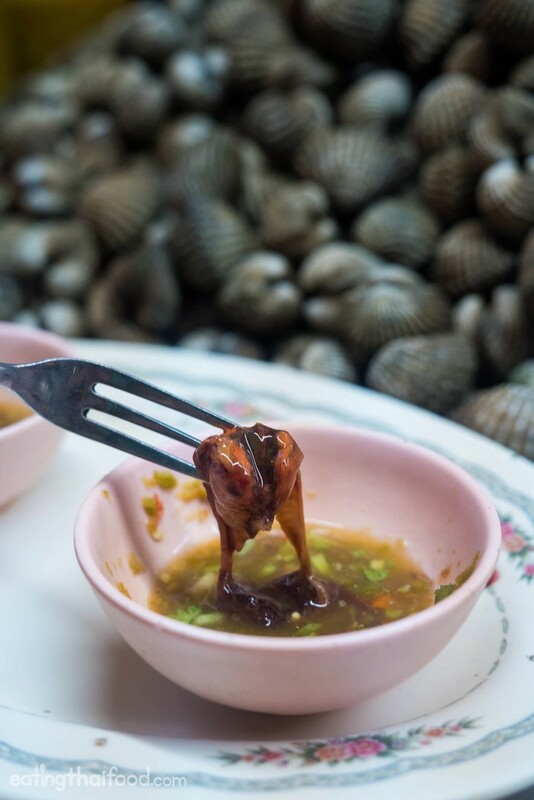 Using a small fork, the blood cockles came out of the shell effortlessly, and after a quick dip into the sauce, they just melted in my mouth. 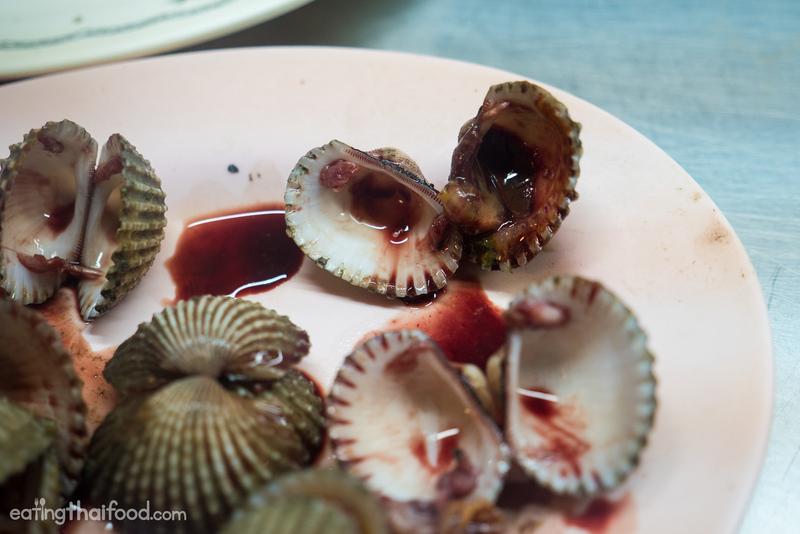 Sometimes blood cockles can have a seafoody, kind of muddy flavor to them, but these tasted extraordinarily fresh and pure (though I know they are quite dirty creatures). 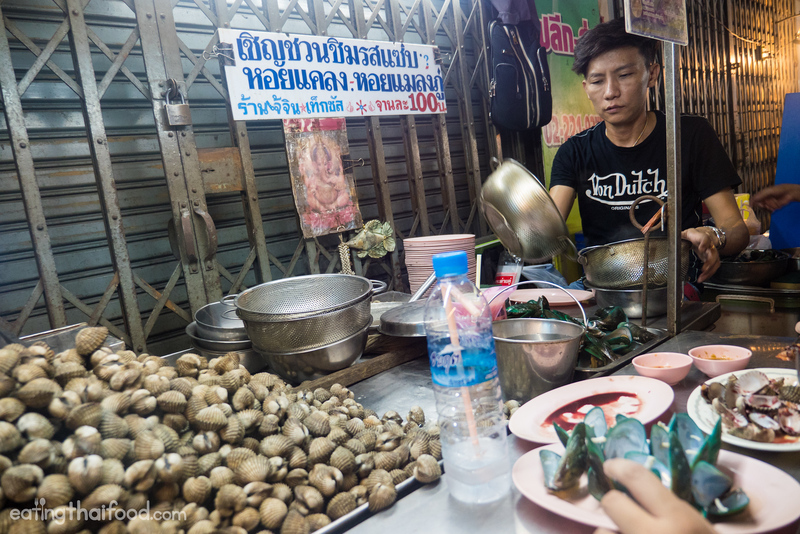 Although most people come to eat hoy kraeng luak (หอยแครงลวก), they additionally offer hoy malaeng pu (หอยแมลงภู่), boiled mussels. The mussels are also a wonderful addition to a shellfish snacking session. They were cooked a bit longer than the cockles, so they didn’t have any kind of a slimy texture to them, but instead they were extremely buttery in texture, and not at all chewy. Again, with the same dipping sauce, they were superbly delicious, and the freshness is what really stood out. Sitting right in front of Pa Jeen (ป้าจิน) on the bar counter seating, while slowly eating my plate of blood cockles and mussels, she became more and more friendly as she noticed my enjoyment. She told me that she had been selling in this exact place, the same exact thing, for over 40 years. She is an amazing lady, and an example of taking a simple thing, and putting ones whole heart into it. She wanted me to take her photo as well! If you have a few minutes, watch the video of eating at this stall below. The video includes a full day of food in Yaowarat (Chinatown) and the part at Hoy Kraeng Pa Jeen (หอยแครงป้าจิน) starts at 25:28. I don’t think anyone can eat at Hoy Kraeng Pa Jeen (หอยแครงป้าจิน) and not recognize the simplicity, quality, and freshness of what they serve. 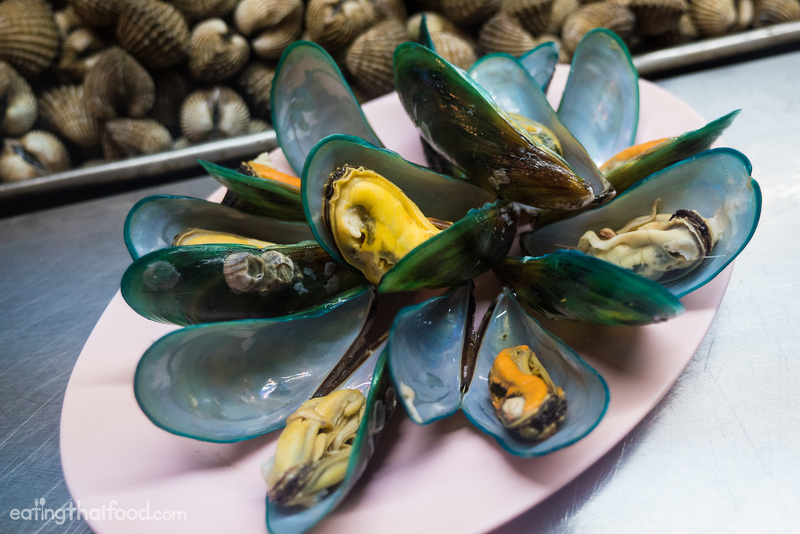 Taking just simple blood cockles and mussels, boiling them perfectly, and serving them with a side dipping sauce, is what Hoy Kraeng Pa Jeen (หอยแครงป้าจิน) seriously excels in. Hoy Kraeng Pa Jeen (หอยแครงป้าจิน) is truly a gem of a street food stall in Bangkok, and they serve something so specific and well proven throughout the years. 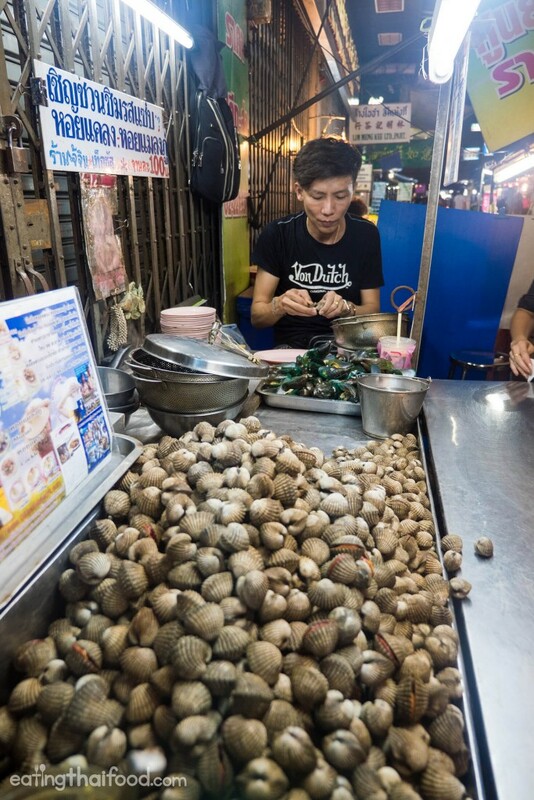 If you love blood cockles, or if you’d like to give them a try, this is one of the best places in Bangkok to eat blood cockles. It could be your new favorite blood cockle bar! เปิดบริการทุกวัน 18.00 – 24.00 น. How to get there: Hoy Kraeng Pa Jeen (หอยแครงป้าจิน) is located right in the heart of Yaowarat Chinatown in Bangkok, along Phudungdao Road, which is also known as Soi Texas. The stall is just down the road from the famous T & K Seafood and Lek & Rut Seafood. NOTE: If you’re allergic to shellfish or if you’re not comfortable with shellfish, please do not risk eating shellfish. 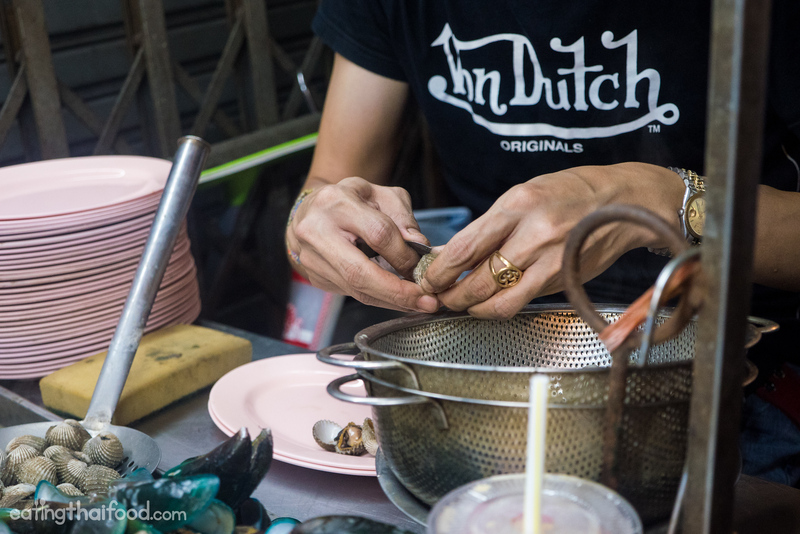 But if you enjoy shellfish, when you’re in Bangkok make sure you eat them at a stall that serves them extremely fresh and takes care of them, like here. 9 comments. I'd love to hear from you! They are so ugly, I couldn’t eat this !!! I saw your video about blood cockles and wanted to try them. I live in Ban Pong, Thailand. About 70 km west of BKK. There is a large fresh food market where I bought the hoy kraeng. I will boil them today and make a dipping sauce like I saw in your video. Thanks. Hey TC, great to hear that, hope you enjoy them. They are especially good with that sauce! When I’m in BKK, my friends order these every day. I have learned to love Hoy Kraeng. I have a hard time opening those little suckers. Luckily, I have friends that help me out. Thanks for sharing Chad, glad you’ve learned to enjoy these little blood cockles! Glad you enjoyed it Danilo! I spent many years in Thailand and I’ve never eaten so well as in the restaurants you recommended .